It’s very exciting and overwhelming living in a city where there are so many new food ventures starting up weekly. It feels like every day I’m hearing about a new restaurant or food cart and when you don’t eat out a lot (I really enjoy cooking…and having dinner at home) you start making lists. This cart has been high on my list for awhile now but I am almost never downtown (who crosses those bridges?). But I did go through downtown for a little hike in Forest Park and realized I was hungry and I hadn’t packed any food. Then I remembered the food carts that dominate downtown and relaxed. I easily found the D.C. Veg cart and for the first time, ordered without reading the entire menu. When I was little, my parents used to take me to D’Angelo’s, which is sort of fast food but not really. It was definitely a chain or a franchise but it wasn’t burgers and shakes. They served everything in pitas and it was cooked on a griddle. The place smelled of onions and peppers and I used to only want the steak and cheese melt. As an adult, I had forgotten all about cheese steak sandwiches. I knew they existed but they were inhabitants of another planet and I no longer thought about those far-away flavors when I stopped eating meat at 15. I don’t know why I never thought to just make it at home with seitan, but that is besides the point. This cart has reminded me that you can still enjoy flavors of childhood. Maybe it won’t be exactly the same, but I think close is not a bad thing. Trying to veganize something doesn’t have to be all or nothing. No matter how hard you try, nutritional yeast will not taste like cheese, but it still tastes good. So I say kudos to the D.C.Veg cart on SW 3rd and Washington for making a mouth-watering, greasy delicious sandwich that I would order again and again. They even make their own seitan, which I am proud to report is juicy and is seasoned just right. It’s not rubbery and blah like some we all have tried before. They have it on the grill? griddle? 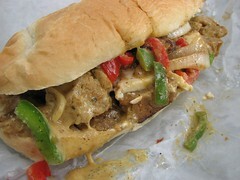 so the outside is seared and the peppers and onions…well, that’s my weakness. There was a nice sauce that went over everything, sort of nayo-naisyish but better and there were slices of vegan cheese. My only improvements would be to maybe grate the cheese because it didn’t really melt as slices. So for me to only have one change to a sandwich is a pretty high compliment. YUM! I saved a little for my husband to try and all he can talk about lately is when we can make it there, but since they aren’t open for dinner, we might have to save it for a holiday or sick day. WOWZERS! That had be drooling from your description alone kimmy! Sounds and looks amazing. Thanks for the heads up on vegan knitting’s bread machine blogging. I’m not a fan of onions and peppers, but when they’re soft and on a sandwich, I can dig it. Does it make you crazy that there are all these restaurants and stands you want to try, when your thrifty soul is telling you to cook at home? I think that would be really hard. I guess it helps if people who regularly eat out write reviews and then you can be selective. What a yummy looking sammy!